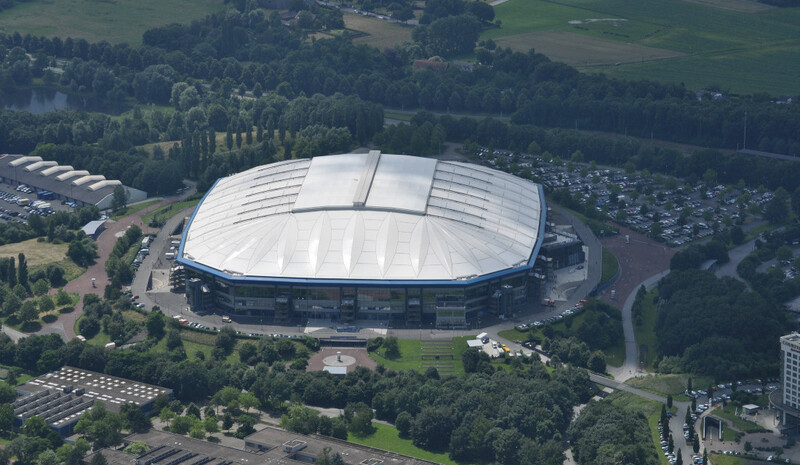 The VELTINS-Arena, before 2005 known as the Arena aufSchalke, replaced Schalke’s old Parkstadion. It was the first stadium in Germany that was completely privately financed without government subsidies and came at a cost of €191 million. 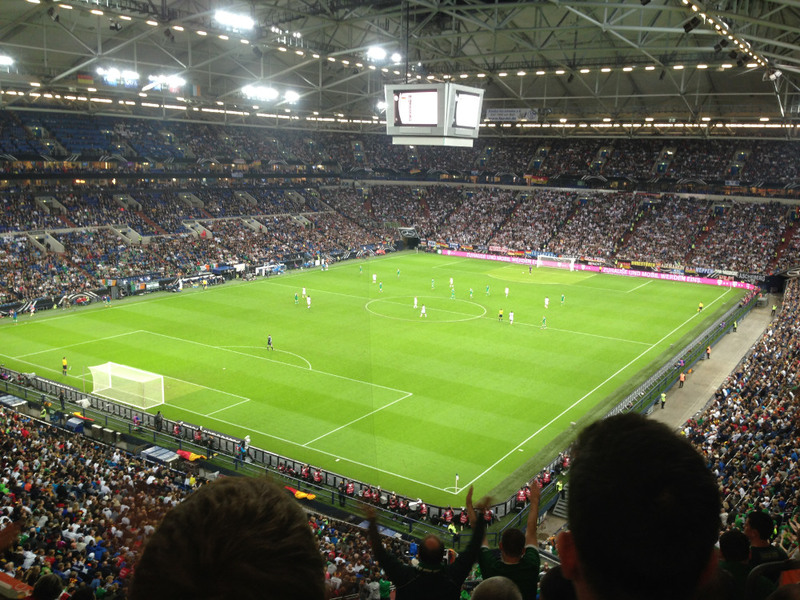 The VELTINS-Arena officially opened on the 13 August 2001 with a friendly three-team tournament between FC Schalke 04, Borussia Dortmund, and 1. FC Nürnberg. The first match played at the stadium was the one between Schalke and Dortmund (0-0). When it opened, the stadium was one of the most technically advanced in Europe with its combination of retractable roof, slide-out pitch, and movable South Stand. 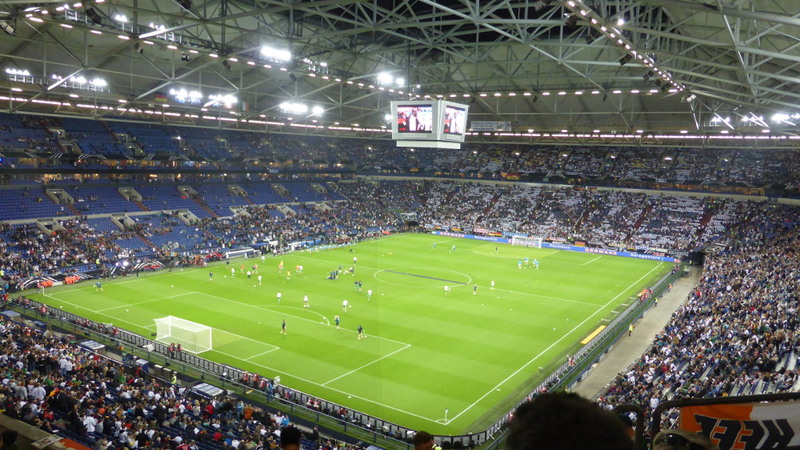 The VELTINS-Arena was one of the playing venues of the 2006 World Cup, hosting four group matches and the quarter-final between Portugal and England (0-0). Two years earlier, in 2004, it had hosted the Champions League final between FC Porto and AS Monaco 3-0. 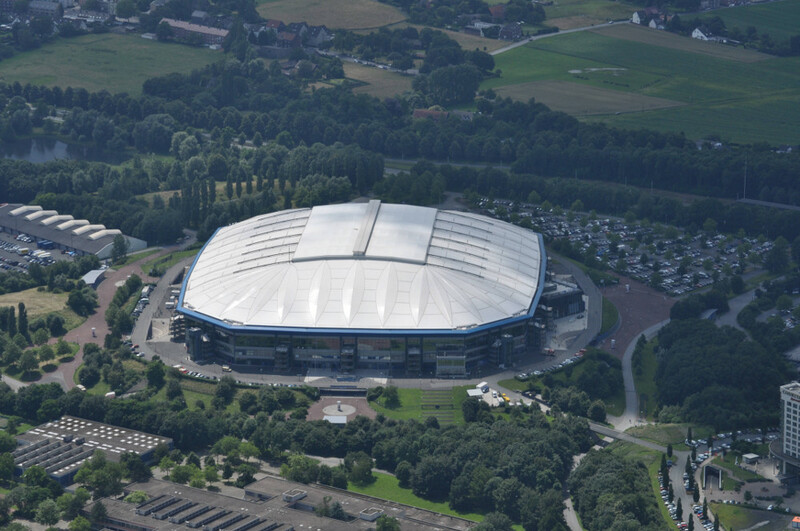 The VELTINS-Arena is located in the north of Gelsenkirchen in-between the A42 and A2 motorways that cross the city from the east to the west. If arriving from the A42, take exit 17 Gelsenkirchen-Schalke. Turn north onto the Alfred-Zingler-Straße and follow the road with a left curve for about 2 kilometres. Turn right onto the Kurt-Schumacher-Straße and continue until you see the stadium on the right hand side. From the A2, take exit Gelsenkirchen-Buer. Turn left at the roundabout, and after a few hundred meters again left onto the Kurt-Schumacher-Straße. After a little more than a kilometre the stadium will show up on your left. Following the Kurt-Schumacher-Straße south for about 6 kilometres brings you to Gelsenkirchen’s city centre. 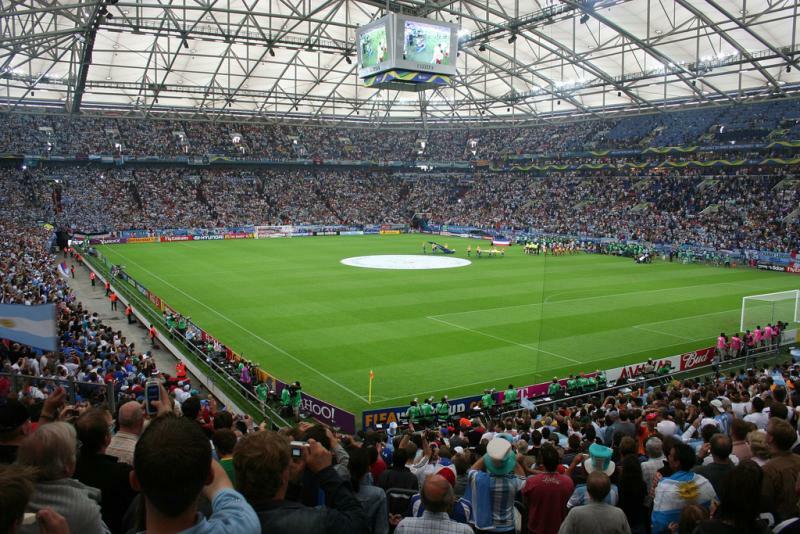 If using public transport, the VELTINS-Arena can be reached with tram 302 from Gelsenkirchen’s main railway station (Hauptbahnhof). Take the tram (Stadtbahn) in the direction of GE-Buer and get off after approximately 15 minutes at stop VELTINS-Arena. The area around the VELTINS-Arena is of little interest in terms of entertainment, though there are a Multiplex cinema and some food outlets nearby. You can also take a look at the remains of the old Parkstadion. There are two hotels in the close vicinity of the stadium: the Courtyard by Marriott comes in the high-end category, while the Hotel Arena is for those with a more modest budget. While there are more hotels in Gelsenkirchen’s city centre, you might also want to consider staying in for example Düsseldorf or Bochum if you want to enjoy the nightlife. Regional trains and the S-Bahn connect both cities with Gelsenkirchen’s main railway station. Tickets for Schalke 04 matches can be bought online, by phone +49 (0) 1805-150810 (Ticket Hotline), or at the S04-ServiceCenter at the VELTINS-Arena. Schalke sell out most of their home league games, though tickets for many matches will be easily available if bought well in advance. For high-profile matches it is recommended to buy straightaway when they go on sale for the general public. Ticket prices range from €26.00 for an upper-tier corner seat to €52.00 for a central seat at one of the long sides. A ticket for the standing area costs €15.50. Schalke charges €10.00 more for a seat for the matches against Dortmund and Bayern. You can find a seating plan of the VELTINS-Arena here. Schalke 04 offer guided stadium tours that include access to the press room, changing rooms, business club, and Schalke-Museum. The tours last about 75 minutes. Tours generally run most days of the week twice a day, but can get cancelled when there is an event at the VELTINS-Arena. Check out the official website for the current schedule. Call +49 (0) 209 3618 900, or email tour@schalke04.de for bookings. The tour costs €9.00. Entrance to the Schalke-Museum only costs €5.00. The museum is opened Tuesdays to Fridays from 10:00 am to 6:00 pm (5:00 pm between March and February). On Saturdays and Sundays the museum opens from 10:00 am to 5:00 pm. For more information email museum@schalke04.de or call +49 (0) 209 3892 900. Schalke04.de – Official website of FC Schalke 04. Veltins-arena.de – Official website of the VELTINS-Arena. VRR.de – Journey planner and ticket information. Schalke 04 operate 5 shops in addition to their official online store . The main one is located inside Veltins Arena and is supplemented on matchdays by over five kirosk and four mobile sales units. Superb place! I was blown away by the stadium. Very good train connection from city centre. I would recommend it to every football fan. Very comfortable seats and the view is just amazing. I should add that car parking is free and there is plenty of room to park as well. If you want to go to a Stadium, without being ripped off like most in the UK: give yourself a treat and make a pilgrimage to Schalke. When the stadium was first opened it was said that ‘you’ve never seen a Stadium like this’. True, very true due to the multi use possibilities- football and indoor events, even biathlon when thousands of tons of snow are shipped in (after the pitch has been slid away under the seating stands!). Not only that, the Museum is well worth seeing, the Club shop is always well stocked with quality products, without being a rip off: and the restaurant including Charly’s bar serve good grub and drinks at reasonable prices.We are regular Visitors when we travel to visit Family in Minden; but then we’re Schalke04 fans anyway!